Julio Cesar Chavez Jr.: Will a New Boxing Legend Begin? Once upon a time (according to popular perception and retelling), Julio Cesar Chavez Jr. grew up with a silver spoon in his mouth with servants and anything he wanted in all of Mexico if he would merely say the word. In reality, when he was just a little kid, the same harsh life any other boxer could tell you about began. 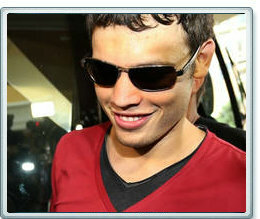 The reality is that Chavez Jr. is, at the same time, the son of a legendary fighter and a recovering addict. One can imagine just being one of those things would be hard. Together, they can only be understood on some level by those with addicts in their inner circle. Julio Jr. has worked very hard to get his father sober over the years and keep him that way. That much is apparent when the perception of him as a young, spoiled prince who had everything handed to him comes up. Though he is 46-0-1 with 32 knockouts (including an impressive TKO win in seven over Andy Lee in June), Chavez is still seen as a spoiled, lazy kid by many in the media. Certainly Top Rank, his promoter, has taken advantage of his name (what good promoter wouldn’t?) but they have also invested quite a large amount of their own money developing Chavez over eight years to get him HBO-ready. It’s taken time, energy and focus. A big part of that has been the Chavez Sr.’s sobriety which has given his son peace of mind to focus on fighting. With hardly an amateur career to speak of (two fights total), Chavez Jr. came up the hardest way you can. Even with the matchmaking favoring him, he was learning how to fight through a trial by fire. Still, he never felt forced into boxing or like he might want to find another profession. “No. I never in my mind thought about getting out of boxing but there were some times that were difficult with everything that was happening around me. In boxing, sometimes there are a lot of emotions,” said Chavez Jr.
Chavez inherited his father’s name and chin which has thus far not been dented. In all his fights (though he may have gotten cut), he has not been hurt or stunned. Not when Sebastian Zbik (albeit a weak puncher) teed off for the first half of their fight or when Andy Lee landed his Sunday best right on the button. Nothing happened and that fight was effectively over. Even when he tires, Chavez Jr. seems to take a good shot. All that has readied him for this moment: heading into his toughest fight against an aging champion (Martinez is 37 years old with a record of 49-2-2 and 28 knockouts) with a tricky, slickster style. Chavez will have to take everything he has learned to take advantage of this step toward superstar status. There are some who say he takes a good shot because he comes into the ring closer to 190 than he does the 160-pound middleweight limit. In this fight, watching both men side by side, the difference in their frames is obvious. Martinez is a small middleweight better suited to 154 pounds. Chavez looks like he will go up at least one weight class from here. Obviously, Martinez’s age is a factor. He is, by nature, a mover and a counterpuncher. He circles out of the southpaw stance with his arms down or in a defensive posture, hoping you’ll make a mistake. When you do, he attacks at angles and spins off before you can do anything about it. Chavez Jr. already knows he will have to employ his best weapon, a relentless body attack, in order to win. What made his father great was not only his style, the vicious body attack, the relentless pressure or the willingness to get in with just about anyone on the planet. No, it was something more that made Chavez Sr. great. It’s what all great fighters share, an ability to go to another level when the going gets tough. Martinez has shown that ability. Chavez Sr. showed it time and again. Now it’s his son’s turn to pull away on his own and forge his own legend. It starts with Martinez, a champion whose belt he believes Chavez is wearing through political chicanery. If Junior is to become the real middleweight champion, prove Martinez wrong and become his own man, he cannot lose on Saturday. He has to prevail. Monday afternoon at the Fortune Gym, Sergio Martinez had his media day. Lou DiBella, his promoter, was there. I asked Lou what he thought of a bet WBC President-for-Life Jose Sulaiman had made with my leaveitintheringradio.com co-host David Duenez, picking Chavez Jr. The bet was dinner, which I did not include in my original question but mentioned to Lou later. But in the interim, he went off and people filmed it and made it into a story. As Lou would tell me, he was overzealous. I gotta say, it brought a little life into the presser. Martinez appears very focused on the task at hand. His normally longer answers were short across the board. I cannot wait for this fight. What can I say? Boy, was I wrong. I rolled with Ward all through the “Super Six” and then went a bit crazy thinking Chad Dawson could make 168 pounds after six years of not doing it. Make no mistake, Ward was spectacular. He dominated from bell to bell on my card but Dawson looked spent from moment one. Listless, lifeless and passionless, Dawson looked like a guy who did not recover in the rehydration process. After seeing them fight, it’s clear under any circumstances that Ward is the overall well-rounded fighter. No question. I’d like to see Ward vs. Andre Dirrell sooner rather than later. To me, it’s really the only worthwhile fight for Ward at 168, barring someone like Gennady Golovkin jumping up. The division is now clean. And no, I won’t be picking against Andre Ward again anytime soon. “Andre Ward reached for greatness,” HBO’s Max Kellerman said after referee Steve Smoger stopped the fight in the 10th per Dawson’s capitulation. No, he didn’t, Max. Had Ward moved up to 175 to challenge for Dawson’s belt, he would have. Ward defended his turf. Dawson made the weight sacrifice and the reach for greatness taking on a dangerous, superior fighter in his hometown. Is there a more dangerous fighter at 140 than Lucas Matthysse? The answer is no. Let’s see if the WBC will allow him near the winner of Danny Garcia vs. Erik Morales II. Yeah, I know. For my money right now, give me Golovkin and Matthysse as two of the most exciting guys out there. We need more knockout artists and these guys are becoming just that. Fights like this make you remember why people love heavyweights so much throughout history. There is something about two big dudes beating the hell out of each other until one of them can’t go anymore. Travis Walker may be an upset special to win but he is a lock to make any heavyweight fight exciting. Adamek is at that point but it made for some exciting outing. Speaking of “It’s getting to be that time,” Vitali Klitschko is out of opponents and things to prove in my opinion. Thanks for the memories. You should be a pound-for-pound guy. Let’s get to the part where you relinquish that belt and a bunch of contenders square off for it. I think John Molina Jr. panicked in there against Antonio DeMarco and ref Jack Reiss may have pulled the plug too soon. I’d have preferred him calling it a knockdown and going from there. Molina never got going. An absolute shame. I think the fight had more fun left in it. But DeMarco came to win and win he did. Bring me DeMarco vs. anyone. If Broner wants it, I’d love that fight. If he doesn’t, we may have to consider caring about him as someone who wants to entertain us. I’m tired of all these different leagues in the sport. Let’s see some action.